Of the numerous Native languages and dialects spoken across this region a few centuries ago, only a handful remain today. 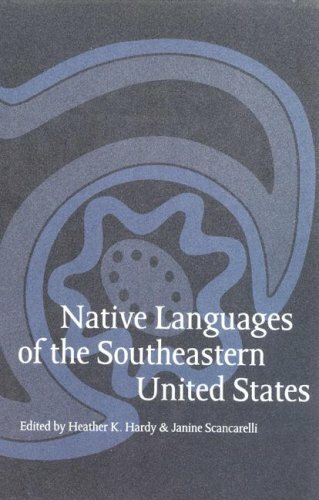 Native Languages of the Southeastern United States presents a comprehensive survey and analysis of the southeastern Native languages at the close of the twentieth century. The diversity and richness of these surviving linguistic traditions emerge clearly in this valuable volume. Contributing linguists draw on their latest fieldwork and research, starting with a background chapter on the history of research on the Native languages of the Southeast. Eight chapters each provide an overview and grammatical sketch of a language, basing discussion on a narrative text presented at the beginning of the chapter. Special emphasis is given to both the fundamental grammatical characteristics of the language—its phonology, morphology, syntax, and various discourse features—and those sociolinguistic and cultural factors that affect its structure and use. Two additional chapters explore the genetic relationships among the various Muskogean languages (Creek, Alabama, Choctaw, Chickasaw), the only language family confined entirely to the Southeast. Wide-ranging in scope and detailed in its examination, this collection is indispensable for understanding the linguistic heritage of southeastern Native peoples.